Honey We’re Home Mission Statement: To genuinely encourage women to take care of themselves by being more healthy and fit, stylish, organized and productive so they can live a vibrant, joyful life. Many of you said you like it all, which is good news for today’s This & That post! I was considering renaming this series “Coffee Talk” since they are random chit chats where we just catch up on everything that’s going on lately- basically ALL the HWH categories in one brain dump of a post! And y’all know how much I love my coffee – with Vanilla Caramel creamer, please! 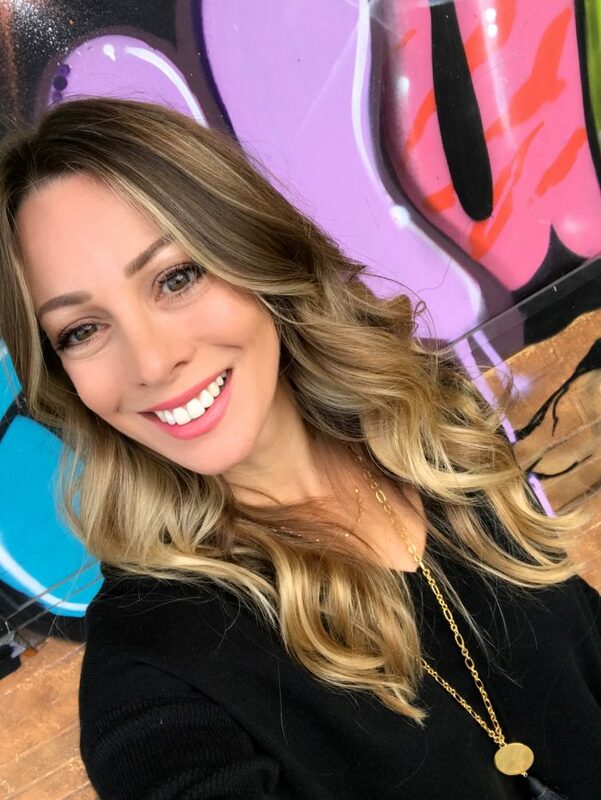 First up, I wanted to share my hair color journey from blonde to bronde hair, especially since I know lots of you are interested in getting this look for yourselves. 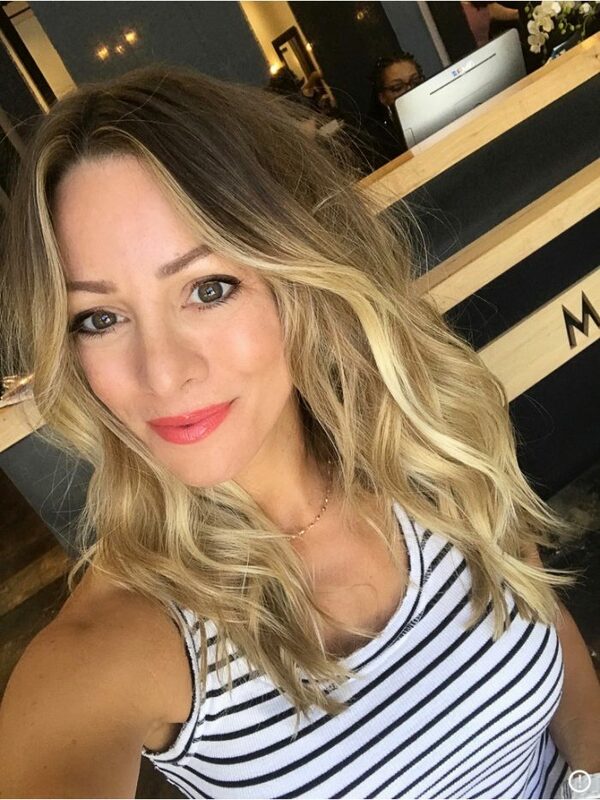 If you’ve been here for a few years, you know that I’ve always been super blonde, but I was so over the maintenance and I felt like it was starting to look too one dimensional. My original hair colorist is so great at blonde and I loved how she used to do my hair, but she ended up going on maternity leave and I had to go to someone new who didn’t do as great a job, ultimately causing me to have to go to repeat visits which damaged my hair- plus after having Jordan, I had tons of breakage around my face. 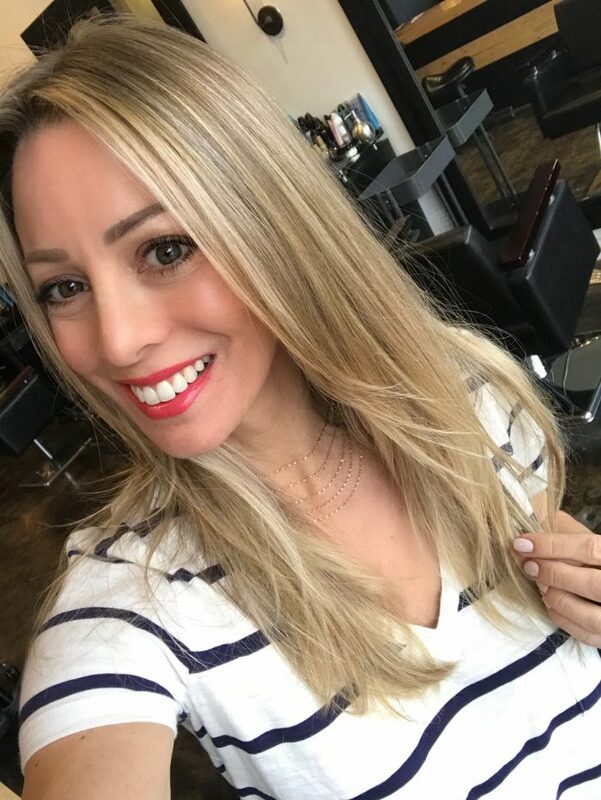 But, thanks to YOU, one of my sweet readers reached out and told me about Chris at M Salon who does a ‘melting’ technique that lets your hair grow out natural looking, slightly darker at the top and lighter throughout the bottom. 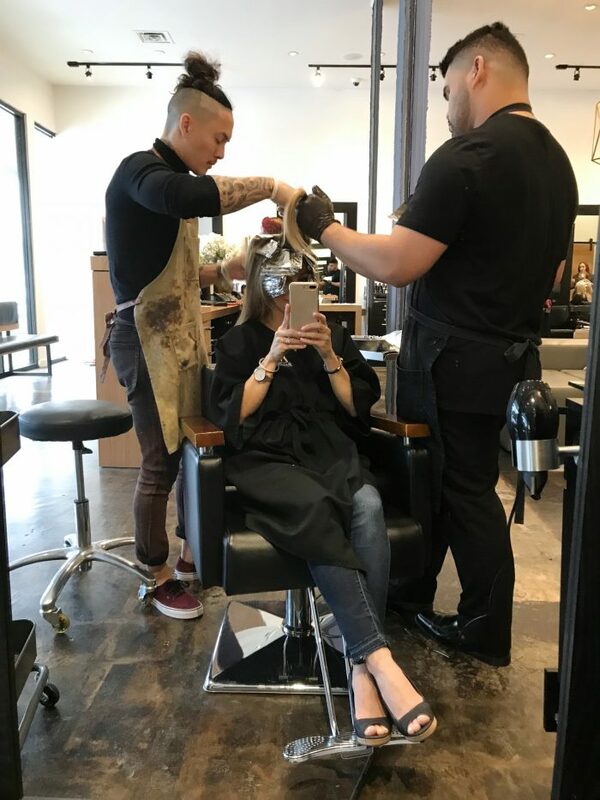 He does baby foil highlights and then rinses it out in sections, so that it’s slightly darker at the root and that darker color “melts” into the lighter color gradually. After my first visit, I was hooked! Although it was darker than my original blonde, it was lighter than the with all those lowlights and just blended so much better! I absolutely LOVED how he was able to smooth the hair color so it looked more natural and not so low and hi-lighted. Just a soft pretty bronde! After my first visit with Chris, I wanted to wait as long as possible to go back to give my hair a chance to grow and get healthy. I was hoping to make it a year, but my hair grows fast, so after 8 months, I knew I need a touch up and went back. Below is a look at how my hair grew out just before visit #2. Not only did I love how he styled my hair, the color was fresh again, even with keeping the roots darker. Now I think my sweet spot is 5 months in between visits, which is SO MUCH BETTER than every 5-6 weeks!! Here’s what it looked like before visit #3. See how he gets the roots to blend better into the rest of your hair? It grew out so nicely, I think this is my favorite look- a bit darker with lots of dimension throughout. This is after my most recent appointment and I asked Chris to add in more blonde, and I like it, but I think I’ll like it even better when it grows out a bit and is a little darker on top. I’ve found that I really like the color a little darker. It’s pretty blonde now, so I’m hoping it grows out as natural looking as it has in the past! Lots of you said you were showing Chris’ Instagram page to your own stylist- a few people have driven hours to book an appointment with him! And I actually ran into one of my readers at this last visit! She was there getting a consult with Chris! It was awesome to sit and talk in person for a change!! If you missed it on Stories, I posted my easy hair curling tutorial and how to fake a salon blowout and saved it to my IG Highlights! I absolutely LOVE it when you’ve sent me pictures of your hair after you tried it! Y’all are lookin’ good!! The Skinny Confidential, Him & Her Podcast– although Lauryn is so very “LA”, I still find this podcast full of great tips from experts on topics from wellness, fitness, beauty and relationships. It’s entertaining and she is actually a great interviewer. Amy Porterfield – Online Marketing Made Easy – Amy is so likable, her voice is easy to listen to and her podcasts are full of info to help you succeed in your business. She does a lot of product launches, which isn’t something I’ve delved into yet, but I still find the information useful. 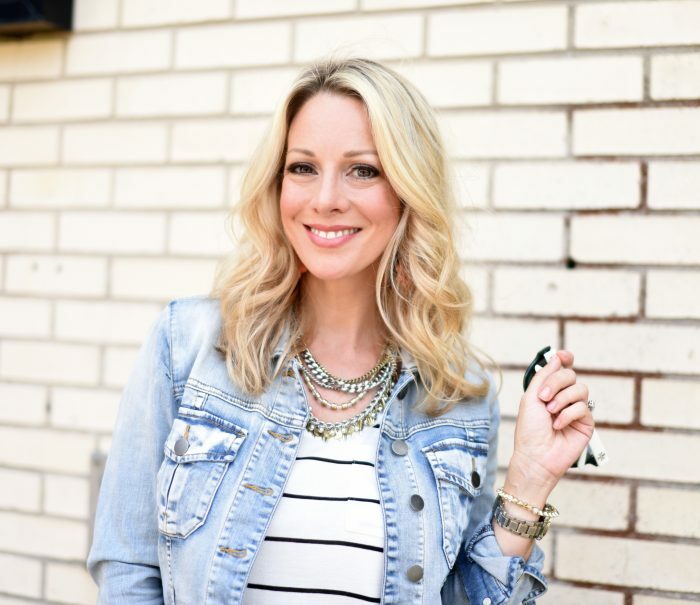 Chalene Johnson – Chalene’s podcast is awesome because it’s to the point and covers topics from health and fitness to positivity coaching and social media and business growth. On my Facebook page, several readers recommended Heather Dubrow’s World as a fun podcast to listen to and Mom and Dad are Fighting is entertaining as well. What podcasts do you listen to?? The style posts are still some of your faves, so here’s a look at some recent outfits and a few new things for Spring, if it ever gets here! I also gifted myself a new pink marble iPhone case and I really like it! And I got a pretty pink pop socket that actually does help me hold my big iPhone 7+ better! After I got the 7+, I loved the bigger screen, but it is large for a petite woman’s hands. I’m on my phone all the time (trying to be better at putting it away after 4 until kids bedtime), so I am glad I have the larger phone. This little popsocket gadget is genius! I can’t believe I waited so long to get one! I’m crazy for a new (to me) brand of jeans I’ve been wanting to try for awhile now! It’s the Wit & Wisdom brand with Ab-solution technology that’s designed to ‘shape, mold and hold’. I bought the light wash bootcut jeans and I’m their new number one fan! 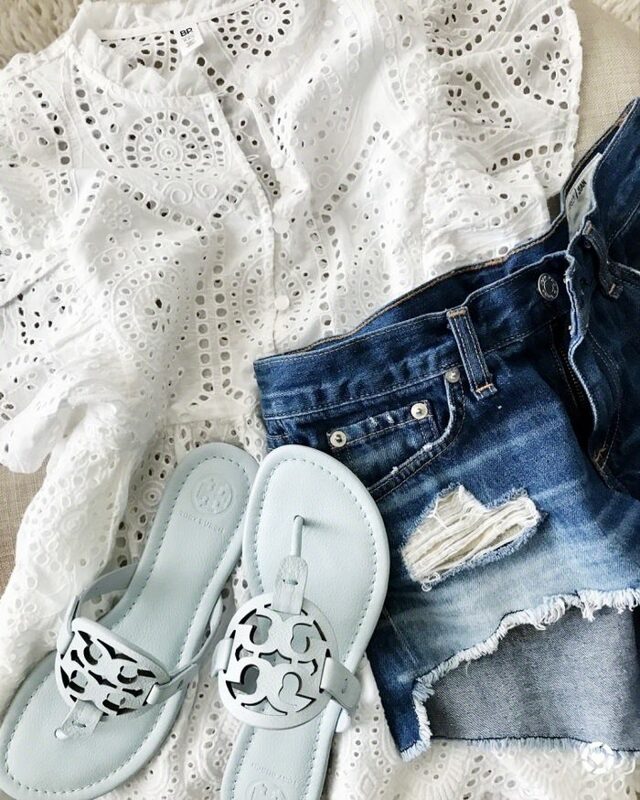 The fabric is so soft and stretchy, but because of the bootcut shape, they don’t look like a jegging. I sized down one from 0P to 00P and that worked perfectly for me. I’m 5’1 and the length is just right when worn with 3-inch heels. 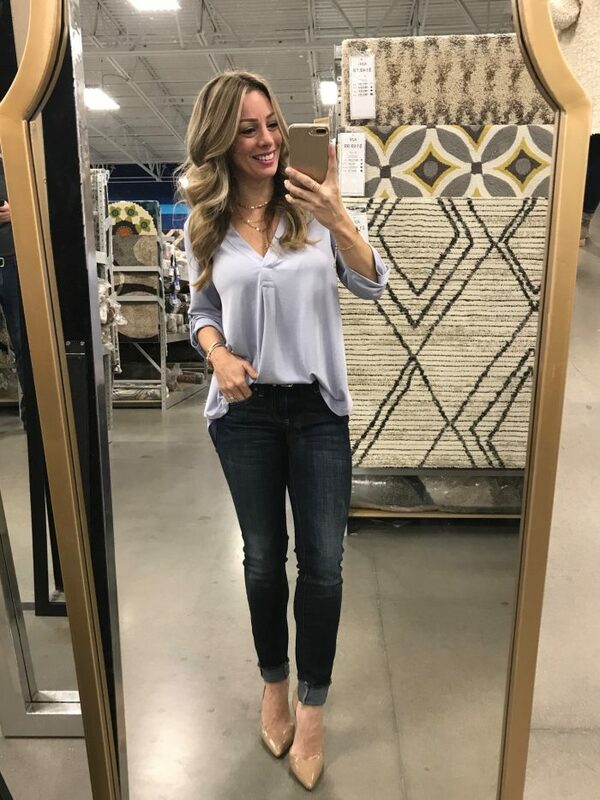 STYLE TIP: For legs that look super long, wear pointy toe heels with your bootcut jeans- that will elongate the look of your legs. I also like to keep my top more fitted or at least partially tucked in to show off more of the legs! As for the top, it’s that comfortable lightweight sweater material that is so easy to wear. It’s got a deep-V neckline that will show off a bit of your lacy bralette. FIT TIP: To give yourself more support in the bralette, wear your strapless bra underneath! I’m wearing mine in this picture. Without the strapless bra, the bralette has about the same support as a triangle bikini top. You can adjust the shoulder straps. I’m 34D and wear size Medium in the bralette. Here’s a pic of the shorts on! With this sunless tanner!! That lotion gets you a nice color, but you have to wear the glove because it will stain your palms! I love it for the suntanned look it gives, but I have to admit, it’s not the best smelling when you first put it on. For a spray tanner that actually smells decent, I like this one! I’ll dry off after showering, then step back inside and spray it on so I don’t get any on the bathroom floor! But I also ordered this pair of ripped jean shorts that looks like it has potential with the fraying and worn edge. But, that pair is higher waist, so we’ll see. When I get them I’ll share with you! They’re more reasonably priced at under $80. This playful dress is a WINNER!! 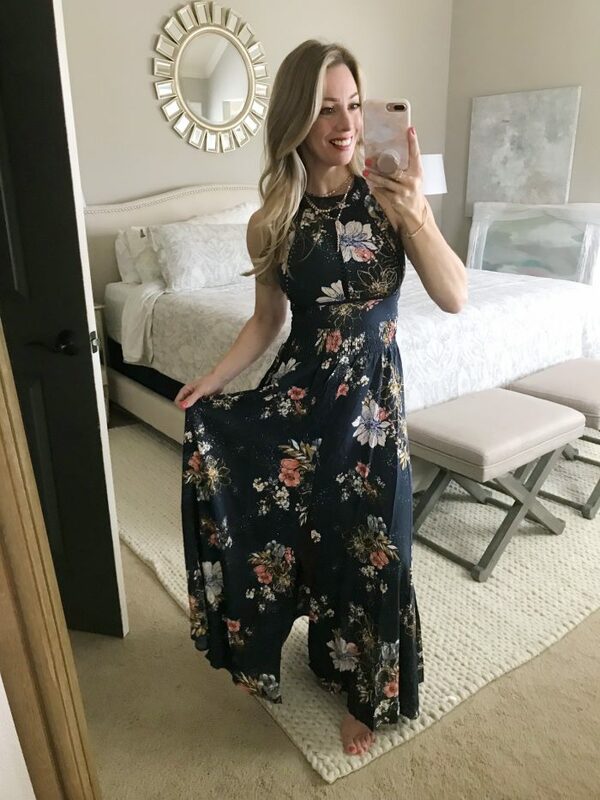 It’s got a gorgeous floral print and sassy cut with a knee-high slit in the front and it hooks at your neck and ties around the back, leaving the upper back beautifully exposed. 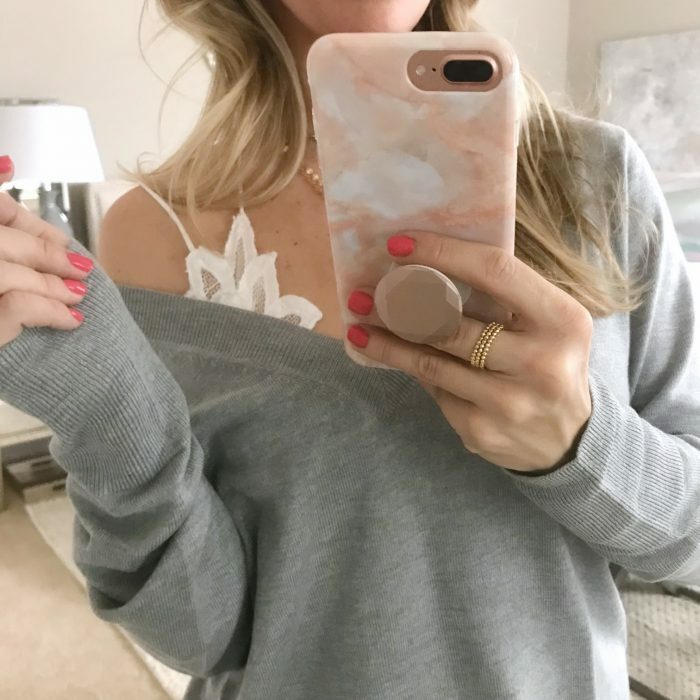 I didn’t wear a bra with it, but if you need some support, or you just feel more comfortable with something covering the girls, try this Backless Bra. BACKLESS BRA SIZING & FIT : It’s recommended that you size up, so I tried my normal size D and the DD, but my regular size D fit me best. A & B cups have push-up pads, C-DDD cups don’t. And note, the bra stays in place better with a fitted top. 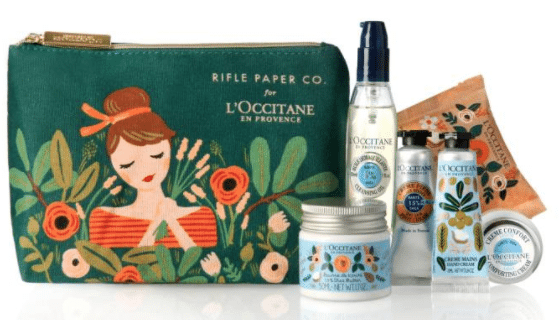 The collaboration between L’Occitane and Rifle Paper blew mind mind! Two of my favorite brands collided into one and I’m seriously smitten with the result! Just look at the packaging goodness!! I think it would make a super cute birthday/teacher/Mother’s Day gift! 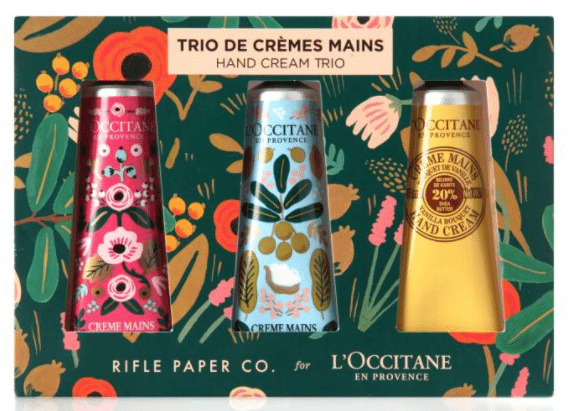 The Hand Cream Trio includes three hand creams- shea butter, vanilla bouquet, and wonderful rose. The Shea Butter Kit includes shea: Comforting Cream, Cleansing Oil, Ultra-Rich Body Cream, Hand Cream, Foot Cream, and Extra-Gentle Milk Soap with an adorable travel bag. I have so much more to chat with you about, but I gotta get to bed! That pesky cold is nipping at my heels and I’m determined to beat it!! Have a great day friends! I’m so glad you brought up podcasts. My favorites are The Big Boo Cast (with Melanie Shankle and Sophie Hudson), The Popcast with Knox and Jamie, and Masterpiece Theater (currently discussing Victoria, which I am so hooked on). The first two make me laugh and any of these make my day! Great blog post, too! I love your hair, especially #4. You do have a blonde personality and the gentle shading is perfect for you. I love the coloring on your hair but I’m guessing you don’t have a lot of gray in your roots? I would never be able to go that long between visits! Nope, no gray here yet! That Happy Hour one is on my list! I need to check out the others! Always love your posts! I love what Chris has done to your hair. It always looks good, but I love his melting technique! I hope this blonder color grows out well! Megan, I love Your “This and That” posts! They are always so full of great tid bits. Your bronde hair is gorgeous and so flattering. Love the look!! Thanks so much Debbie!! I’m so happy to get to wait longer in between visits! I envy you – I have to get mine colored every 4-5 weeks due to the gray hairs. It’s so much maintenance! I know the struggle! Oh my goodness, podcasts!! Haha! I am pretty sure you used to read Young House Love? But they have a podcast and it’s always full of great tips and info, I think you’d really like it. I also love Happier with Gretchen Rubin, and probably like you’ve been told a million times if you haven’t listened to Dirty John yet, do it!! DJ is only 6 episodes, so it’s not a big commitment but you’ll want to keep listening. I subscribed to the Gretchen Rubin podcast, I just having listened yet! I just started listening to podcasts this year too! My favorite is For The Love with Jen Hatmaker! Oh I’ve never heard of that one, thanks for sharing! I started listening to several podcasts early last year. My favorites are Young House Love Has a Podcast, The Happy Hour with Jamie Ivey and Sorta Awesome. I also found the coolest App called overdrive. You create a log-in, select your library where you have a card and you type in your library card number. You can download audio books or e-books straight to your phone or iPad for FREE. I’ve always loved reading but with two little kids I don’t have a lot of time but I love to listen to the books. That would be awesome! I need to try that!! 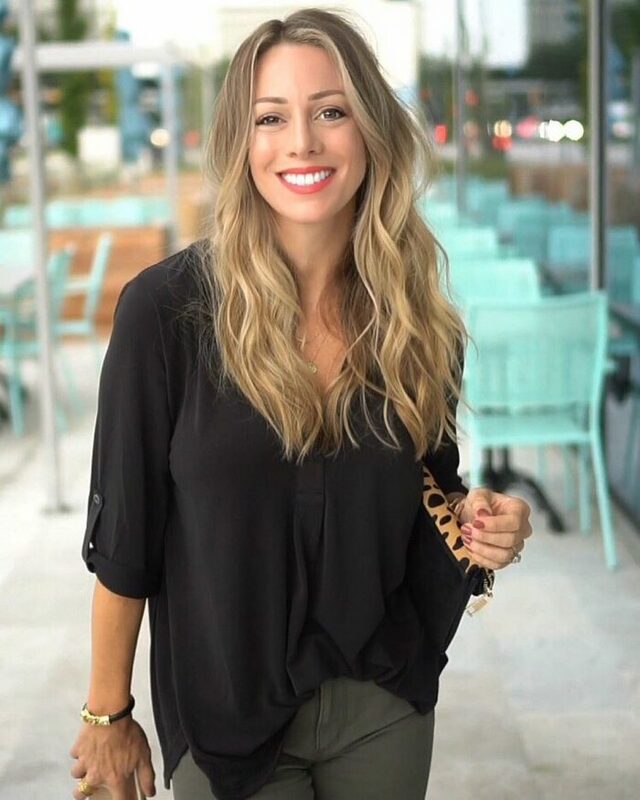 3) That’s so maven – health and wellness blogger interviewing others in the field on their health journey and passions. Thank you so much for that! I’m looking for more! 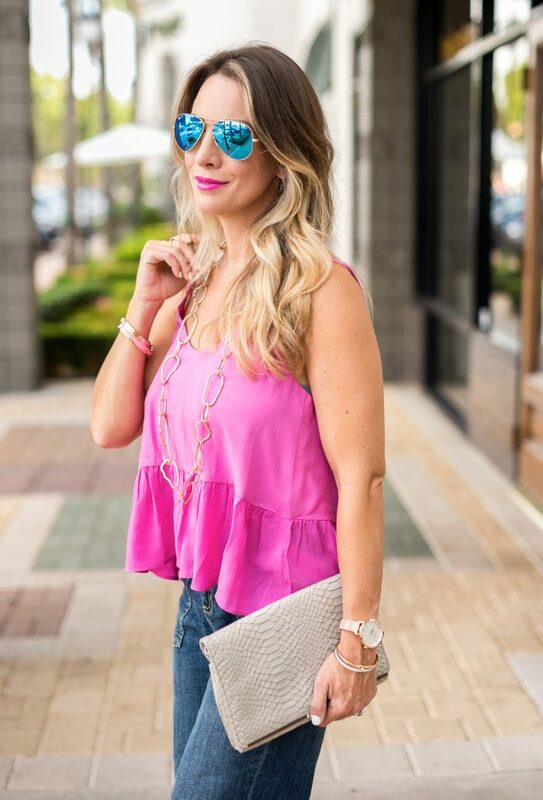 I just adore your blog- always so fun to read! Your hair is *so* pretty!! I go every 4 weeks (ugh!!) to color my gray. I’m 43, but got gray roots a long time ago. Boo!! I’m definitely going to check out your podcast recommendations……that will come in handy at work to break up the day. That maintenance is so hard! Our plates are already full! I clicked on the link to your hair tutorial and it took me to your IG page but I couldn’t figure out how to find the video to watch from your IG page….do you mind telling me?? Usually I don’t have trouble with things like this!! Ha! Love your hair!! Hi Beth! Are you able to see highlights when you go to Instagram? They are the little circles that have videos above my regular IG photos. I love your hair so much! It’s looks fantastic. I would love to have him do mine because I haven’t been really happy with my hair for awhile now but I live in Baton Rouge. My husband would think I’d lost my mind if I told him I was driving to Houston to get my hair done. I just got my 2 inch curling iron in and I cant find your Instagram Story on how to fake a blowout. It says it’s on your Instagram Highlights but I can’t find it, can you help. Thanks!